We want The D-Day Story to be fully inclusive. We offer free admission to personal assistants, friends or carers. When you enter the museum the ticket desk is on your right hand side. You can also find out more information about the museum from our staff or volunteers. There are two accessible toilets. There are no steps in the museum. The majority of floors are completely level and all ramps are designed for wheelchair users. The majority of paths through the museum displays are 1,500mm or wider. There is one narrow route of 1,050mm, but this is not a main pathway through the exhibition. Turning circles in the exhibition are at least 1,500mm. There are no low level barriers or trip hazards in any of the displays. There are no internal doors in the museum displays. If there is a doorway between one gallery and another, it will be at least 1,300mm wide. All activities in the displays have been designed to be viewed from a wheelchair. All corners and joints in the displays have smooth edges. Every exhibition gallery apart from one (‘Battle of Normandy’) has seating with arm rests. 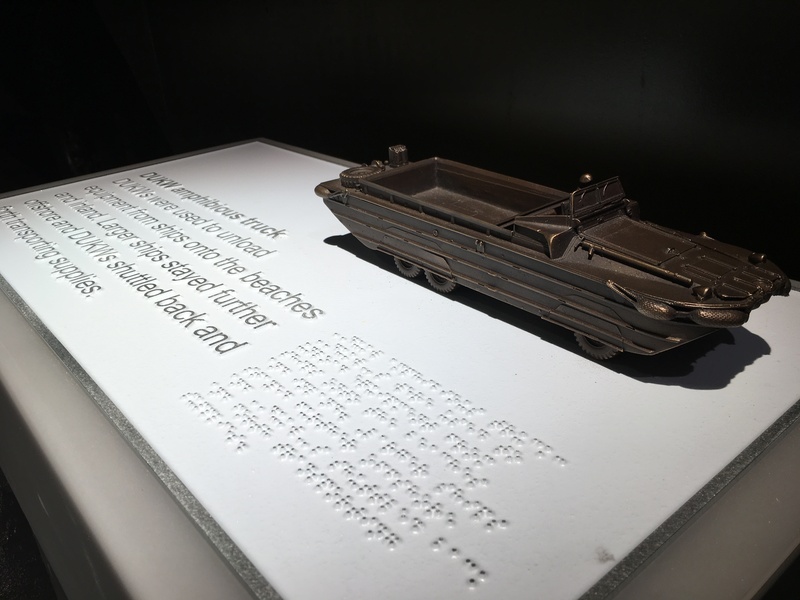 We have a free audio guide of the Overlord Embroidery gallery specifically designed for blind and visually impaired visitors. To borrow a guide, ask the staff at reception when you arrive. The main reception, café and shop are well lit. There are low light levels in the display spaces. Once a month we will hold a ‘Chilled out museum’ event where we turn up the lighting in the displays, more information can be found on our Events pages. We have three touchable models and two maps that have descriptions written in Braille. The fonts used in the exhibition are at least 20pt or above. On the display panels there is a clear contrast between the writing and the background colour. There is a clear contrast between the colour of display plinths and the floor. Guide dogs are welcome. There is a park and green space within 100 metres of the museum where you can take them for a break. There is an induction loop at the main reception to the museum and throughout all the museum displays. Each month we hold a ‘Chilled out museum’ for visitors who would like a more relaxed experience. We turn the lights up and sound down in the museum. There is a guide that you can borrow that will tell you about what you can see in each room. If you can’t find a guide, please ask one of our friendly staff for help. For further accessibility information, please see our Visit England Accessibility Guide. You may find our website accessibility information helpful to getting the best user experience from this website.